This is in connection with an exhibition here in Savannah. More savory examples particularly needed. Thoughts? Please ask around! Answer below or on Rubi’s blog. Thank you, brilliant and generous people! Read the column in the September 13, 2009, New York Times Magazine, or here. It’s no accident that Julia Child appeared on public television — or educational television, as it used to be called. On a commercial network, a program that actually inspired viewers to get off the couch and spend an hour cooking a meal would be a commercial disaster, for it would mean they were turning off the television to do something else. The ads on the Food Network, at least in prime time, strongly suggest its viewers do no such thing: the food-related ads hardly ever hawk kitchen appliances or ingredients (unless you count A.1. steak sauce) but rather push the usual supermarket cart of edible foodlike substances, including Manwich sloppy joe in a can, Special K protein shakes and Ore-Ida frozen French fries, along with fast-casual eateries like Olive Garden and Red Lobster. Yes. And of course those advertisers know exactly what they are doing: Associating their processed or prepared-for-you foodstuffs and meals with the vague idea of hands-on cooking. Maybe watching someone expertly prepare a meal from scratch is something that makes you feel good, and if a can of Manwhich can associate itself with that good feeling, nonconsciously of course, perhaps that association will still lurk in your brain somewhere as you wheel through Kroger. The whole piece is actually full of great stuff about consumer behavior, advertising, and entertainment, filtered through the lens of food. Great stuff. Does an $8 chocolate bar offer something besides taste to the beleaguered consumer? This week in Consumed, a look at “compensatory consumption,” through the lens of pricey chocolate. Their thinking is that the little boost of, say, pricey chocolate, might not be solely about mood but about responding to threats to status or competence, Rucker told me. Ideally you would respond to such challenges directly: standing up to a boss who is pushing you around, demonstrating skill to silence skeptics and so on. But often the sources of undermined confidence are more abstract. “What’s happened in modern society under capitalism is that people have found consumer products as an outlet, a safety valve for addressing these threats in a very indirect fashion,” Rucker contends. Consumed archive is here, and FAQ is here. The Times’ Consumed RSS feed is here. Consumed Facebook page is here. Today, as part of a special food-themed issue of the New York Times Magazine, Consumed looks at an effort to get kids to drink more milk — by putting pop culture branded characters on the cartons. Read the column in the October 12, 2008 issue of The New York Times Magazine, or here. 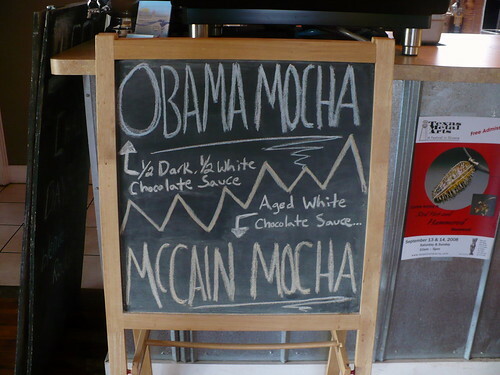 obama mocha vs. mccain mocha, originally uploaded by _cheryl. Seen at genuine joe coffeehouse, austin, tx. This week in Consumed, a look at Red Mango’s rivalry with Pinkberry. It’s a cliché that the fight for survival brings out the best in business rivals, but a clear rivalry is also useful to consumers — it’s something to latch on to, an opportunity to take sides. Many Red Mango locations are in conspicuously close proximity to a Pinkberry. Kim claims this is a “coincidence,” owing more to his own chain’s real estate research than to any provocation. But read the reviews on Yelp.com of the Pinkberry and Red Mango locations that more or less face each other on Bleecker Street in New York. The Red Mango at 182 Bleecker registers four stars out of five, based on 74 reviews — many of which reference Pinkberry directly. Read the column in the September 7, 2008 issue of the New York Times Magazine, or here. Puffed treats that make your noshing feel a little more virtuous. This week in Consumed, a look at a snack that seems to have drawn a crowd by way of its virtues, its quirkiness, its honest — and kept it despite some pretty serious road bumps. Pirate’s Booty hasn’t simply leveraged unusual consumer loyalty into a business with a reported $50 million in annual revenue. It has held onto that loyalty despite incidents that would seem to cut against its image. A few years ago, the Good Housekeeping Research Institute slammed the brand after its own tests found that a one-ounce serving of Booty contained 8.5 grams of fat, not 2.5 as the label indicated. And in 2007, the company issued a recall of its Veggie Booty and Super Veggie Tings varieties after they were linked to cases of salmonella. Included: Founder explains that “Good For You” is not so much a claim as a congratulation: “You bought this bag — well, good for you!” The product contains no MSG and no preservatives, and therefore the buyer deserves a pat on the back for choosing a snack that’s not so bad: “Wow, you chose something that is going to change your life,” he says. Read the whole column in the June 29, 2008 issue of The New York Times Magazine, or right here. Of recent and not entirely frivolous interest on The Blognut: A Q&A with the cofounder of the outstanding Top Pot Doughnuts, addressing that Seattle-based business’s deal with Starbucks, which I hadn’t realized is apparently nationwide. Oklahoma City Mayor Mick Cornett joined Taco Bell President Greg Creed today at the Taco Bell restaurant on 13920 North May Avenue to announce a unique partnership in support of the OKC Million Challenge. Beginning today, Taco Bell’s Fresco Menu, offering 9 items with less than 9 grams of fat, will become the Official Menu of the Mayor’s Challenge. Do we really need democratically elected governments signing endorsement deals with internationally franchised restaurant megachains? On the positive side, the mega food companies also greatly expand distribution for their acquired brands, and have the ability to market with much deeper pockets. They sometimes even allow their new baby brands to influence some of their business thinking. While it is now au courant to become green or more natural, for example, the insights and influence corporate giants are getting from their newly acquired brands has actually begun to effect change in their thinking. . .and that’s a good thing. Second, Mr. Fromartz has gone direct to the source and done a quite interesting Q&A with Honest Tea co-founder Seth Goldman. I recommend checking out the whole thing, but a few things I want to highlight here. Goldman specifically mentions the distribution issue noted above as a major plus for his company in the new deal. I can’t tell you how many times this comes up when I interview startup entrepreneurs — you can have all the clever marketing and awesome consumer evangelism you want, but without distribution, you’re limited. Most interestingly, Goldman even cites McDonald’s as “an example of the kind of account that we will now have access to,” meaning they can at least get in the door for a meeting, because of the Coke connection. It might seem surprising that a successful new beverage can’t do that on its own. And I’m not in a position to say with certainty whether it’s 100% true all the time. But it doesn’t surprise me at all; it’s quite consistent with stories I’ve heard before, in plenty of categories. We’ve gotten a lot of emails, mostly positive but some negative. One of the most important points is I’m not trying to excuse or rationalize what Coke sells. They’ve obviously been successful at it. But if people think their product is unhealthy, then their desire should be to see more Honest Tea available wherever Coke is sold. Remember your name, Honest Tea? The name implies that there is something less honest or dishonest out there that is being sold, and you are the alternative. Being the alternative – it’s part of your DNA. So you have to make the case that Coke will not compromise all that your brand stands for, and has stood for, over the years. Heck, all that YOU stand for. While aware that Hydrox cookies were becoming harder to find, many of their fans are learning only now they are gone. Still reeling from their loss, Mr. Nadeau and other “Hydrox people” have yet to accept their fate. Some have started an online petition demanding that Kellogg bring the cookie back. They have collected 866 signatures. Also, the story does not give a URL or link for the mentioned “Web site devoted to Hydrox” where Nadeau made the “dark time in cookie history” comment, or for the petition. I found the petition, and I found this Hydrox site, but I can’t find Nadeau’s comment. If you have the link please pass it along. Never mind that last request, the mystery has been solved for me in the comment below (thanks adam! ): Nadeau’s quote is from the guestbook of that same Hydrox fan site, right here. I’ve been reading with great interest the various marketing gurus talking about the brilliant campaign preceding the movie version of The Simpsons. I make no predictions about anything, such as whether the film will actually do well. But if it does do well, here are a few secret ingredients that — so far as I know — the experts haven’t mentioned yet. These, in other words, are the “lessons” you can apply to your film or brand. I’m revealing them to you now! Are you ready? Here goes! You heard it here first! 1. Prior to the release of your film, create a successful television program. 2. Do this many years before TiVo, or the widespread availability of 200-channel digital cable packages, or Mosaic (that’s Netscape kids; do people still know what Netscape was?) and all that it begat. 3. Enlist an authentic creative genius to actually invent your show. 4. The creative genius should be a known (and revered) quantity among certain audience members because of his work in something that was called the “alternative press,” which was kind of like the “niche culture” thing that today’s gurus talk about, but back before it had made its way into the marketing lexicon. 5. Make sure the show stays consistently strong — for 18 years. 6. Do this in a way that continues to attract new generations of viewers who have absolutely no idea what pre-Web culture was like — but without alienating those viewers who do. 7. By the time your film/product is released, make sure that the above-mentioned groundwork has woven your TV show deeply into the American pop psyche, so that its various catch phrases and references can be used universally, and without explanation, in almost any situation. Once you do those seven things, you should be set. Good lessons! Apply them well! While he was at Kraft, from 1949 to 1957, Mr. Traisman led the team that combined cheese, emulsifiers and other ingredients into the bright yellow sauce called Cheez Whiz. Imagine the excitement of being in on the Cheez Whiz team. It must have been the Manhattan Project of bright yellow sauce invention. This post was written by Rob Walker on June 9, 2007	Comments Off on Not cheese. Cheez.